There might be a vegetable shortage on the way, but Abel & Cole’s carrot and orange supplies seem to be going strong. Mr Rice and I have been inundated with them over the last couple of months. Carotenosis threatened, so I froze them away week after week. The freezer was getting full though, so I decided to cook them all up into a delicious carrot and orange soup – which we will ration of course. Fry the chopped onion in a little oil and butter, then cover the pan and sweat for a few minutes. Peel and chop the carrots add them to the onions and stir well. Cover again and sweat the vegetables for about 10 minutes. Then add the stock and stir well, followed by the spices, coriander and the orange rind and juice. Bring it to the boil and cover, and simmer for 1 hour, stirring occasionally. 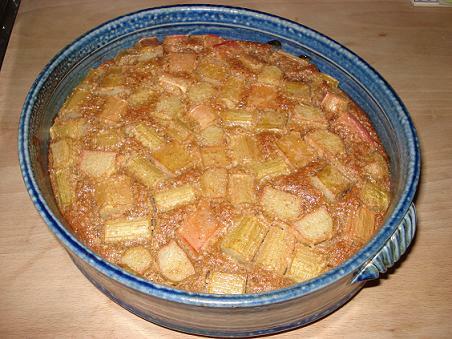 It’s finished cooking when the carrots are really soft, and break easily when you stir it. Add the milk, stir well, let it cool a bit, then blend until as smooth as you like it, add salt and pepper to taste. Add a dollop of creme fraiche and reheat. Serve with a swirl of creme fraiche, garnished with coriander leaves. This recipe really is a family heirloom, just like my great-grandma’s book, which holds the original recipe. It’s really simple to make, and it was one we were trusted to make ourselves when we were kids. The measurements in the recipe are quite idiosynchratic, meaning that it never turns out the same, hence the name ‘different every time’. The original recipe does start with pastry, but I have never included this, and it doesn’t detract from the quality of the pie one bit. 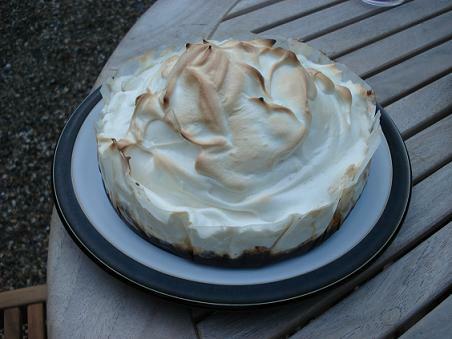 My mum made baked Alaska for us a few times when we were kids, and it used to fascinate me. Cooked ice cream! Plus it combines two of my favourite things – ice cream and soft, chewy meringue. Add light, fluffy sponge and some strawberry jam and it’s the perfect pudding magic trick. Simon Rimmer made this chocolate version on telly a couple of weeks ago, and I couldn’t stop thinking about it until I made it for myself. It quite fiddly to put together, but actually pretty easy. The scary part was while it was cooking, hoping that I had sealed all the meringue around the ice cream, so it didn’t melt. And the chocolate sauce is the best I have tasted. What an absolutely perfect recipe which I will definitely be using again – Cheers Simon Rimmer! For the chocolate sauce, put the sugar, butter and vanilla seeds into a pan over a medium heat and stir until melted and combined. Then add the chocolate, water and cocoa and heat gently for 6-8 minutes, until it turns into a glossy, thick chocolate sauce. Get a spoon and take a big scoop of the sauce, then make sure it tastes as rich and chocolatey as it looks. 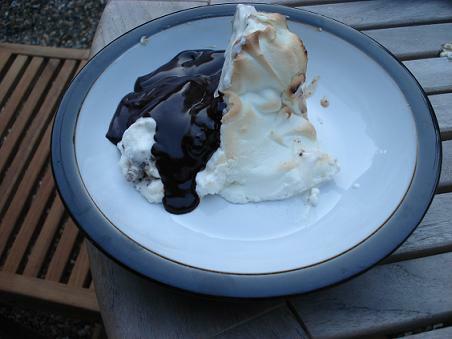 For the baked Alaska, press the brownies into the bottom of a 20cm/8in round ovenproof dish and top it with a couple of spoonfuls of the chocolate sauce, and top that with all the ice cream, make into a dome shape and put into the freezer to chill. Whisk the egg whites with 25g of the sugar until stiff peaks form when the whisk is removed. Add the remaining sugar and whisk again until the egg white mixture is stiff and glossy. Remove the dish from the freezer and spoon the meringue mixture over the ice cream to completely cover. Make sure the meringue completely seals the ice cream so no heat can get in to melt it. Bake for 3-4 minutes (no longer), until the meringue is just golden-brown. Serve drizzled with the chocolate sauce, if you haven’t eaten it all out of the pan. What was intended to be a light, early evening snack turned into our full evening meal when we saw the size of the very generous portions at Harry’s Bar. 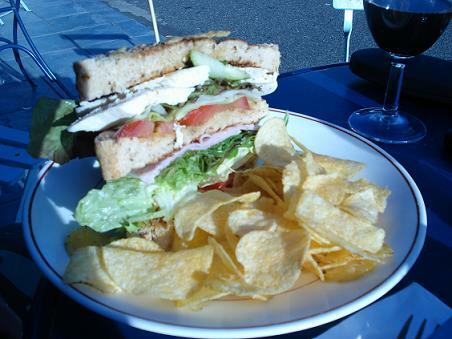 Mr Rice loves a club sandwich when he’s away from home, but this was definitely not the poncy, tiny white bread triangles you get by the pool at some show-off hotel, this was more like a club doorstep made with delicous, tasty granary bread. I had the same bread to accompany my smoked haddock smokie, which was creamy, rich, cheesy and very smoked haddocky – and accompanied by buttered toast and red wine – delicious. And Harry’s Bar’s piece de resistance? 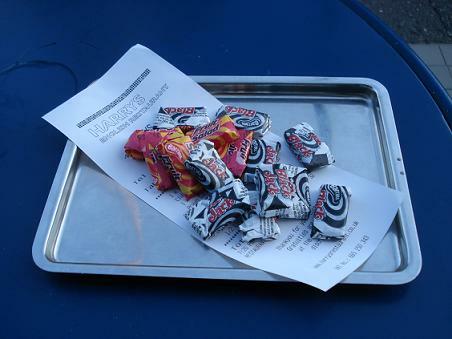 No mint imperials or chocolate orange slices here – but fruit salads and black jacks. Pudding was sorted there and then! Mr Rice and I went to Brighton to celebrate becoming Mr and Mrs one year ago, and took ourselves for a Thai meal. 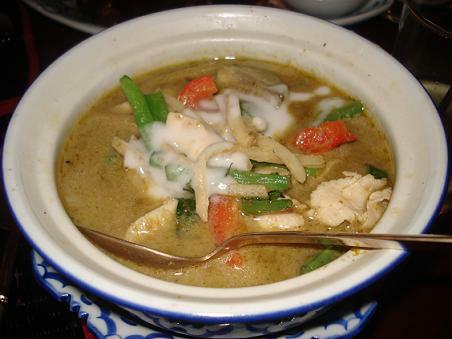 Aumthong Thai had excellent reviews and was just round the corner from our hotel, which made for a relaxed and easy evening. It was also the only place on my shortlist that was not full when I called to book, and it wasn’t full when we arrived either. We started with Dim Sum, which you can’t really go wrong with, and they didn’t disappoint – prawn and pork mince in light dunplings with sweet soy dip. The garnish took up 75% of the plate, and was as fancy and over the top as I have seen. The pristinely carved carrot flower was a bit over the top, and the rest of the garnish was huge. It felt slighty wasteful, but points for effort! 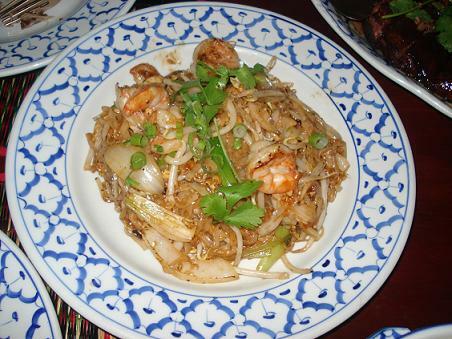 We didn’t stray too far from the woods for our mains – green curry and pad thai! It was tasty and enjoyable but not that memorable. What a gem of a restaurant, surprisingly so given it’s central Soho, touristy location. Try to sit downstairs if you can, away from the hecticness of the street above. Decked out just as a Moroccan restaurant should be with soft, lanterned lighting, salubrious soft seating with lots of cushions and the familar low tables, it serves up delicious, authentic food. I wasn’t that enthusiastic about eating Pastilla in Morocco, as it was made from the traditional pigeon meat. But I do like the idea of the dish itself: minced meat in filo pastry with sweet north african sprices. So it was perfect to find a chicken pastilla on the menu here, flavoured with honey and cinnamon. And it was absolutely divine. Break through the crisp and delicate filo pastry to find chicken that’s light and fluffy and so sweet, I could have eaten another portion there and then. Like a sweet and savoury Samosa I suppose. And when they saw me taking picutres of the food, they took pity on the poor tourists and gaves us a Fez to wear, which provided us with all something to talk about for a few minutes! Cous cous with sweet chutney in the middle was the perfect accompaniment. Highly recommended. You are currently browsing the She likes her food blog archives for July, 2007.